The 2016 Investec Derby takes place at Epsom on Saturday 4th June 2016. This year picking a winner from the 16 strong field in Britain's richest race is very hard. Who will win the Epsom Derby 2016? This article contains our 2016 Investec Derby betting preview with predictions, betting tips, enhanced odds, bookie promotions and no deposit free bets on the race. WINGS OF DESIRE has been one of the most remarkable stories this season. Third in a Newmarket maiden on April 13 the son of Pivotal then went on to score in an all-weather Wolverhampton maiden before taking a huge step up in grade to win the Grade 2 Dante Stakes at York, a prominent Derby trial. US ARMY RANGER has some big appeal, because he has come through the exact same path as 2013 winner Ruler Of The World, as winner of this season’s Chester Vase when he was pushed hard by Port Douglas. He was largely unconsidered for this race at the beginning of the season having suffered a setback which kept him off the track last year, but began to make his way towards the head of the betting following a comfortable win on his debut at the Curragh in April. CLOTH OF THE STARS appeared to finally find his rhythm in a run at Saint Cloud and was supplemented for this race at a cost of £75,000 on Monday. In total has won four times in six starts and has won in heavy going so has no worries about the trip or ground and is a lively contender. Sir Michael Stoute’s colt ULYSSES, has been all the rage in recent weeks and we have seen his price plunge from 50/1 to 9/1. He was an impressive 8 length winner of a Newbury maiden last time out. Looks sure to stay the trip and has the excellent Andrea Atzeni in the plate. ACROSS THE STARS was unlucky in Lingfield's Derby Trial behind Humphrey Bogart and could grab a place with the assistance of Keiren Fallon in the saddle. The Dante runner-up DEAUVILLE also has to be considered. His run last time out was a fantastic effort and a slightly less aggressive ride over 12 furlongs may see him improve. He has won twice from five starts but yet to prove his stamina. RED VERDON first sprung to prominence when impressing with the manner of his victory at Chester’s May meeting. Although it was only a run-of-the-mill handicap he claimed, the speed figure and sectional times he posted that day indicated he was miles better than his rating at the time. PORT DOUGLAS was beaten just a shorthead at Chester when giving the winner Us Army Ranger 5lb. Prior to that he won the Group 2 Beresford Stakes last season. MASSAAT has the best form on offer on his 2000 Guineas second behind Galileo Gold but has stamina questions to answer. MOONLIGHT MAGIC won both starts at two, including listed race, and much better for return (well beaten on heavy going in Ballysax) when winning eight-runner Derrinstown Stud Derby Trial at Leopardstown last month from Shogun, Idaho and Beacon Rock. HUMPHREY BOGART has been supplemented on the back of his gritty trial victory, but even allowing for his straight-forward, genuine and tough nature, he has a tall task on his hands. ALGOMETER won a Derby-prep at Goodwood and could not be ruled out as well as SHOGUN. BIODYNAMIC finished a long way behind Us Army Ranger at Chester and is the big outsider of the Derby. 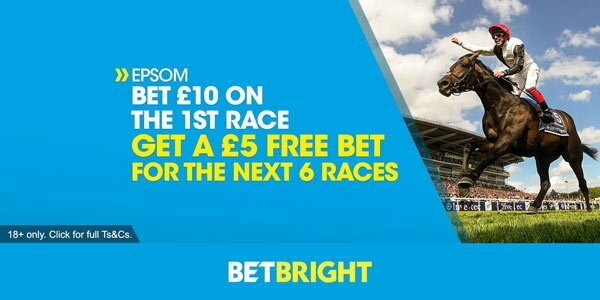 Bet £10 on the 1st race at Epsom, get £5 for each of the next 6 races! £200 welcome bonus - the best bonus on the Internet! William Hill Guaranteed Winner on the Epsom Derby! Max profit €/£100! 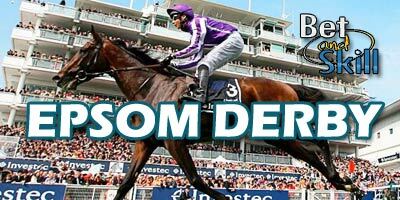 "2016 Epsom Derby predictions, betting tips, odds and free bets (4th June)"